Barrett-Jackson Special Event For Families. You’re Invited. On Saturday, January 14th kids 12 and under get into the world famous Barrett-Jackson Collector Car Auction at WestWorld of Scottsdale for free. That’s because it’s Family Value Day, with adult tickets costing just $17 in advance. It’s a great way to spend time with the whole family and this year there is an added benefit. Family Value Day tickets to Barrett-Jackson also provide General Admission to the world’s greatest arena polo matches taking place on site that day too. One ticket. Two great spectacles. After checking out the country’s most beautiful collector cars watch the world’s top 2 arena polo players lead teams from the USA and England for The Townsend Cup at 2pm. There is also a match between American and British military teams that day at noon. Arena polo is more physical and has more scoring than outdoor polo. And rare is it to see the best 2 players in the world face off in any sport. But that’s what will happen Saturday, January 14th at the ultimate “horsepower” showcase during Family Value Day at Barrett-Jackson. 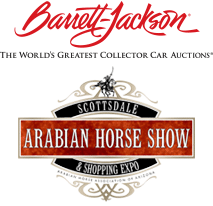 And if you can’t make Saturday, Sunday, January 15th also offers lower ticket prices to stroll the grounds at Barrett-Jackson with 2 additional arena polo matches taking place that day too, including the best collegiate players from England and the USA. If reserved, VIP seating is more your style, those options are available too for Saturday and Sunday. For all information, including tickets visit ThePoloParty.com/Arena/ or call 480.423.1414. And don’t forget to check out Barrett-Jackson.com too.